Does your space need a major overhaul? If you are tired of the same look in your home, choosing to upgrade your flooring is an easy way to make a change. With a simple tile flooring installation, you can take your space to the next level. In fact, new flooring is one of the most popular options that homeowners choose for a fast remodeling job. Whether you are ready to transform your kitchen, bathroom, or hallways, our ceramic tile flooring makes the perfect fit in any room. Upgrading your kitchen or bathroom is as easy as changing your flooring. 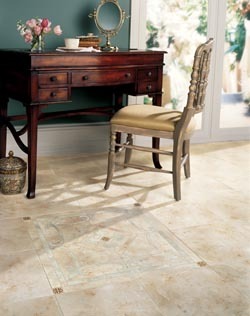 When you shop with us you will enjoy access to a full selection of stylish and durable tile flooring. At our showroom, we feature a complete collection of materials to fit in any type of space. Visit our store today to take advantage of our exclusive tile flooring prices for your new materials. Make the right choice for installing your new tile floors. At our showroom, our skilled and experienced contractors are happy to work with you for your upcoming project. With our exclusive tile flooring prices and extensive selection of products, it will be easier than ever for you to enhance the style of every room in your home. We carry materials from some of the top brands available in the industry today. When you shop with us for your floor tiles, you will find a full selection of brand-name options from Dal-Tile, Happy Floors, and other major manufacturers. Once you have decided on the right tile flooring for your home, turn to us to take care of the rest of your project. Our team of contractors is available to complete a tile floor installation for spaces of any size. Whether you have a tiny bathroom or a large kitchen, you can count on us to finish your project to the highest standard. Installing tile correctly is important to its looks and longevity. This is a complicated task that must be performed to the finest detail with the proper tools and equipment. Laying ceramic floor tile the right way requires you to consider a number of different factors, including the size and shape of the tile. With a professional installation from our experienced team, you will avoid uneven tiles, chips, and other problems. Why Should You Choose Ceramic Tile Flooring? With all of the flooring materials on the market, what makes ceramic the perfect addition to your home? Ceramic tile flooring offers homeowners natural durability and stunning beauty that lasts for years to come. From bathrooms to kitchens, it works in every room. It is moisture resistant and comes in a wide variety of colors, designs, and textures. Ceramic is a durable material that is popular with homeowners for its natural strength. Because this material can stand up to grease and water, it is an ideal addition to kitchens. Shop with us today to speak with our sales team about each of your product options. Contact us to upgrade your kitchen or bathroom with a new set of tile flooring. We proudly serve clients throughout Atascadero, Paso Robles, Templeton, Santa Margarita, and San Miguel, California, plus the surrounding areas.